Province of ancient France lying between the Rhone, the Mediterranean Sea, and the Maritime Alps, although medieval Jewish scholars frequently applied the name to a portion of Bas-Languedoc (Menahem Me'iri, introductionto "Bet ha-Beḥirah," 17b; Estori Farḥi, "Kaftor wa-Feraḥ," p. 113; Abraham ben Nathan, "Manhig," pp. 10a, 19a). Jews settled in Provence at an early date; and in the sixth century they formed important communities at Arles and Marseilles. In 1276 Charles I. protected them against the Inquisition, which had persecuted them severely, obliging them to wear new badges, and going so far in the case of some cities, as Marseilles, Avignon, and Forcalquier, as to throw them into prison and to extort ransom. In 1308 Charles II. forbade them to hold public office. 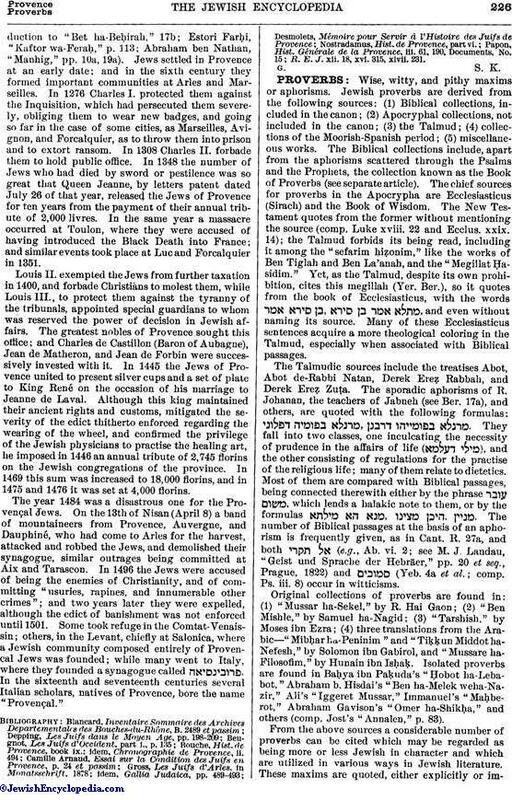 In 1348 the number of Jews who had died by sword or pestilence was so great that Queen Jeanne, by letters patent dated July 26 of that year, released the Jews of Provence for ten years from the payment of their annual tribute of 2,000 livres. In the same year a massacre occurred at Toulon, where they were accused of having introduced the Black Death into France; and similar events took place at Luc and Forcalquier in 1351. Louis II. exempted the Jews from further taxation in 1400, and forbade Christians to molest them, while Louis III., to protect them against the tyranny of the tribunals, appointed special guardians to whom was reserved the power of decision in Jewish affairs. The greatest nobles of Provence sought this office; and Charles de Castillon (Baron of Aubagne), Jean de Matheron, and Jean de Forbin were successively invested with it. In 1445 the Jews of Provence united to present silver cups and a set of plate to King René on the occasion of his marriage to Jeanne de Laval. Although this king maintained their ancient rights and customs, mitigated the severity of the edict thitherto enforced regarding the wearing of the wheel, and confirmed the privilege of the Jewish physicians to practise the healing art, he imposed in 1446 an annual tribute of 2,745 florins on the Jewish congregations of the province. In 1469 this sum was increased to 18,000 florins, and in 1475 and 1476 it was set at 4,000 florins. The year 1484 was a disastrous one for the Provençal Jews. On the 13th of Nisan (April 8) a band of mountaineers from Provence, Auvergne, and Dauphiné, who had come to Arles for the harvest, attacked and robbed the Jews, and demolished their synagogue, similar outrages being committed at Aix and Tarascon. In 1496 the Jews were accused of being the enemies of Christianity, and of committing "usuries, rapines, and innumerable other crimes"; and two years later they were expelled, although the edict of banishment was not enforced until 1501. 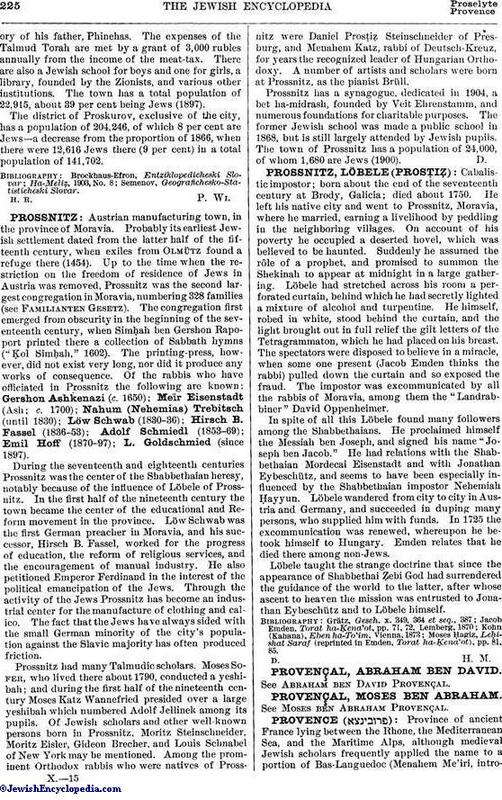 Some took refuge in the Comtat-Venaissin; others, in the Levant, chiefly at Salonica, where a Jewish community composed entirely of Provençal Jews was founded; while many went to Italy, where they founded a synagogue called . In the sixteenth and seventeenth centuries several Italian scholars, natives of Provence, bore the name "Provençal." R. E. J. xii. 18, xvi. 315, xlvii. 231.